No..? Whitelisting is here exactly for that reason. It lets you allow things that are normally disabled. However, the description talks about End portal blocks, that is, the portal itself, not the frames. The frames are not TileEntities, so they can not be packed with this mod. I thought whitelisting prevented all except the listed blocks, but I suppose not. I was unaware End Portal was a tile entity, what data system does the End Portal frame use for the eyes? Just meta? The reason the end portal block is a TileEntity, is that Minecraft uses a TileEntityRenderer to be able to draw the portal effects. It doesn't actually store any meaningful data in it. The end portal frame has two states, yes: empty and full. As for the whitelist, "whitelist" just means a list of things you allow without question. It doesn't care what you do with the items NOT in the whitelist. It's common to disallow them, but in my case it's used to override the blacklist. The logic is "a TileEntity is allowed unless it's disabled by code or in the blacklist, unless it's in the whitelist in which case it overrides the blacklist and is allowed regardless". The difference of this mod is that it is more realistic! Whenever you go to make a home moving you put your objects in a box? Wrong. This mod can also move mod chests, machines and other things like that. If you feel you don't need it, then good for you, but don't presume to know what other people need or want. Am I just dumb or can you not pick up spawners in 1.11 with the packing tape? Spawners can not be picked up unless you have them whitelisted explicitly. Works well! 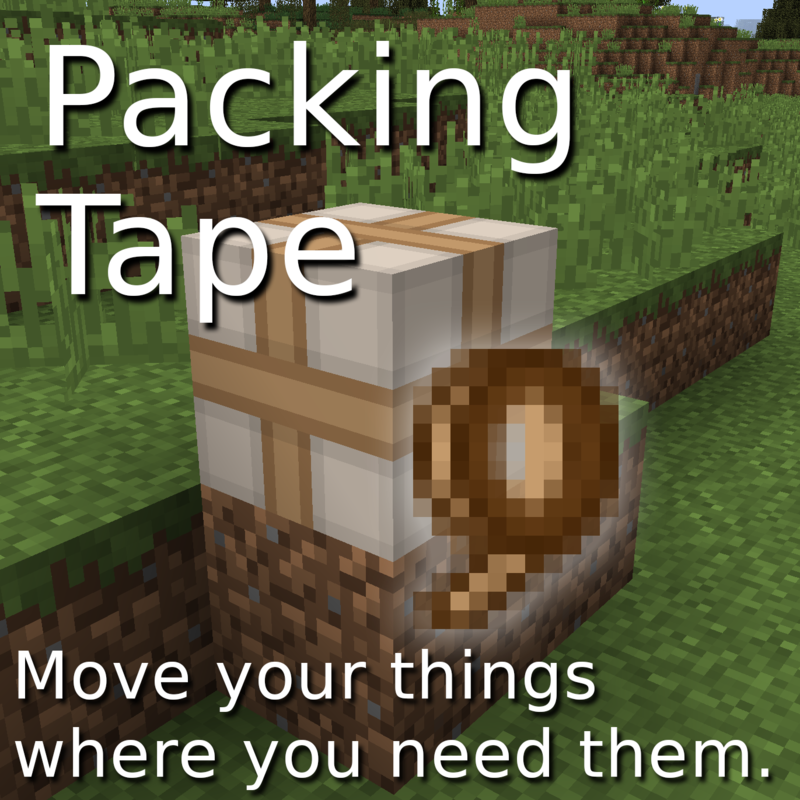 Could you add a config option to allow the packing tape to be reusable? Thanks for considering it, it's just nice as a replacement for the cardboard box from Mekanism, and slime balls can be kind of scarce in early game. Hey just to mention, the 0.6.0 release from some days ago, has multi-use tape rolls, but it requires a piece of paper for each use instead. This is nice! It fits in well with vanilla, which is what I like. I think the textures are fine.